Military officials in Kazakhstan have said they are grounding their fleet of Mi-8 helicopters following a crash in the southern Kyzylorda region that left 13 troops dead. The Ministry of Defense said in an earlier statement that the air force chopper was flying as part of a convoy of four aircraft on a flight from the western city of Aktau to Shymkent, near the Uzbek border, when it crashed on March 27. All the passenger and crew lost their lives. Officials said the operation to recover bodies was hampered by the swamps where the craft went down. The Defense Ministry and the Interior Ministry are both investigating the circumstances that led to the incident. A criminal case has been opened into possible violation of the rules of flight. Speculating on factors under investigation, Talgat Musabayev, a member of the upper house of parliament and veteran pilot and cosmonaut, noted in remarks to reporters that the helicopter was flying at night and in difficult weather conditions. “As a pilot I know what it means to fly in those conditions. The crew did all they could, but equipment is equipment,” he said. Musabayev stressed, however, that it was too early to draw any conclusions about the exact causes of the accident. The Defense Ministry has said it will provide psychological and material assistance to the families of the victims. Mi-8 helicopters are no stranger to crashes across the former Soviet Union, where the aircraft remains most commonly in use. 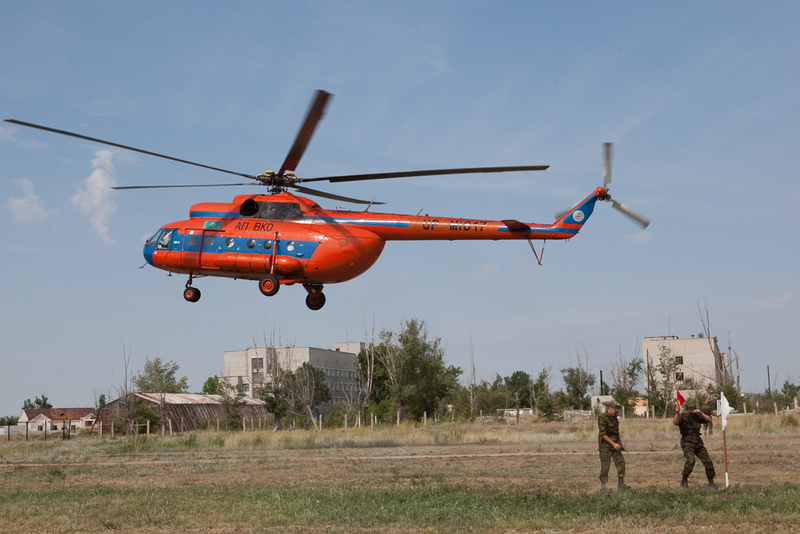 In September, a civilian Mi-8 helicopter carrying 19 employees of the KazTransOil oil pipeline company plummeted to the ground while attempting to take off. There were no casualties in that case. But when an Mi-8 operated by the National Security Committee crashed in south Kazakhstan in September 2009, 10 people were killed and another three injured. The Soviet-designed Mi-8 has been in production since the 1960s and is prized for its heavily-lift capabilities, which it makes it ideal for transporting troops. It has also undergone various modifications to adapt the craft for transporting goods and for rescue operations.